It’s Bubbles’ birthday today so I thought it only appropriate to bring out the second JSF she picked up for the review. Behold: Key Lime Watering Kissmint. If you remember back in the day, there was another Watering Kissmint reviewed and I’ll have to apologize because I just named it “Watering Kissmint” rather than whatever kind of mint it is Watering Kissmint. I had Rob do some translation work for it recently but I can’t remember he said “clear mint” or “crystal mint”. I’m leaning towards “clear” but I’ll have to go ask him again before changing up the first entry. But we’re not here to talk about that. We’re here to talk about this second flavor: Key lime. Man, I had the best Key Lime pie last weekend which is pretty fortuitous because now I’m freshly primed for Key Lime. And also Key Lime gum? Genius! Why has no one thought of Key Lime flavored gum before this? I think Fruit Stripes Gum had a lime flavor as one of their choices but how many other gums came in lime? I’m not finding a whole lot Googling for “lime gum” unless you want to count lemon-lime or strawberry-lime. No lime-lime pops up so that along with my sketchy check out lane memories forces me to conclude that lime isn’t a staple flavor. Why? Lime is a nicely tasty flavor and key lime has that extra…umm…keyness to it. OK, look. If you don’t know from Key Limes then take a gander at this Wikipedia article. For the moment, it will tell you that the extra “keyness” of Key limes is a little bit more tartness, a little robustier limeness and a hint of bitter, although I’ve never really thought of them as bitter. I think of Key limes as the perfect size to cut up and pop into a Corona bottle. 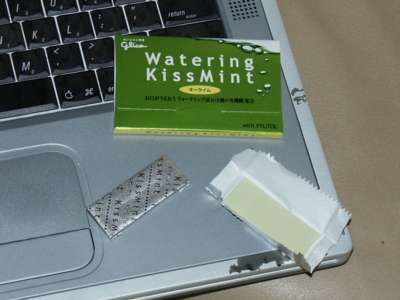 Watering Kissmint thinks of Key limes as the next best flavor for their gum. Rating of 3.5 wasabi peas out of 5.